Crude Accountability is among other civil society organizations that signed the letter to the CEOs of British Petroleum, Chevron, INPEX, Statoil, ExxonMobil, TPAO, ITOCHU, ONGC regarding the Extension of contract for the Azeri-Chirag-Guneshly (ACG) offshore oil fields in Azerbaijan. We express our deep concerns about the quick process for the extension of the contract and ask that a decision on this Risk Sharing Agreement be delayed until meaningful improvements are seen in the governance of natural resources in Azerbaijan. The full text of the letter is bellow, PDF is available via link. We, the undersigned civil society organizations, are deeply concerned about the quick and opaque process for the extension of the contract between the BP-led consortium and Azeri state oil firm SOCAR to develop the Azeri-Chirag-Guneshly (ACG) offshore oil fields until 2050. Following a constitutional referendum in September 2016, President Aliyev has further consolidated power, blatantly disregarding multilateral obligations, fundamental freedoms, and accountability. Given Azerbaijan’s recent suspension from the Extractive Industries Transparency Initiative for failure to enact governance related reforms, renewed crackdowns on fundamental freedoms this year, and rampant nepotism and corruption in the country, we ask that a decision on this Risk Sharing Agreement be delayed until meaningful improvements are seen in the governance of natural resources in Azerbaijan. As the current contract does not expire until 2024, this is an important opportunity to showcase the Consortium’s leadership in promoting transparency, accountability, and good governance of the extractive industries. The renegotiation of the risk sharing agreement for the ACG fields should be an open opportunity to promote civic participation and freedom of expression in Azerbaijan, and not be done in opaque secrecy, which currently prevails in the country. In February 2017, President Aliyev appointed his wife, Mehriban Aliyeva, to the newly created position of First Vice President, placing her first in line to take over the presidency. This unprecedented degree of nepotism obliterated any future chance for free and independent elections, and further entrenched power within the ruling clan. The ruling family extends its reach into virtually all lucrative sectors of the economy. An independent judiciary is non-existent in Azerbaijan, and with the international demand for Azeri oil, the ruling clan practices complete disregard for the rule of law. Further, Azerbaijan has ratified the United Nations Economic Commission for Europe (UNECE) Aarhus Convention, which guarantees citizens the rights to access environmental information, participation in decision-making processes concerning the environment, and access to justice for violations of the Convention. 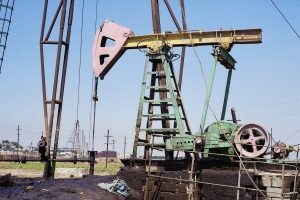 Development of oil fields in the ecologically sensitive Caspian Basin is a process that requires transparency and public participation, per Azerbaijan’s commitments under international law. In this atmosphere of extreme corruption and nepotism, and taking into account Azerbaijan’s international obligations, we urge the consortium to make the PSA negotiation process transparent and accountable for the citizens of Azerbaijan by publically accepting these recommendations and further comments from Azerbaijani civil society. In 2017, President Aliyev renewed his clampdown on freedom of expression, shutting down access to the last remaining independent media sources such as websites of Radio Free Europe/Radio Liberty’s Azerbaijan’s Service, Meydan TV, Turan TV and others. Prominent bloggers including Mehman Huseynov, who documented corruption in Azerbaijan, have been arrested on politically motivated charges. Mehman Galandarov, another prominent blogger, died in prison under questionable circumstances in April. On May 29 of this year, Afgan Mukhtarli, a journalist seeking asylum in Georgia, was illegally abducted in Tbilisi, beaten, and smuggled across the border to Azerbaijan where he now awaits trial on trumped up charges. The European Parliament recently adopted a resolution on this case, condemning this grave breach of law. Ilgar Mammadov, leader of an opposition movement and a member of the advisory council of the Natural Resources Governance Institute, remains in prison after almost four years despite the ruling of the European Court of Human Rights in his favor. In total, there are at least 100 political prisoners now in Azerbaijan and the number keeps growing. International interest in Azerbaijan’s oil reserve undoubtedly fuels this atmosphere of repression and violation of human rights. It is no coincidence that the on the day before the first contract for the development of the Shah Deniz gas fields was signed on December 17 2013 with the BP led consortium, Anar Mammadli, prominent human rights defender, was arrested. This was the first time a human rights defender was arrested in Azerbaijan since its independence, and in this way Aliyev sent a strong signal that human rights were to be traded for energy. This disdain for the rule of law and ongoing violation of human rights in the country must change. As indicated in the UN Guiding Principles of Business and Human Rights, respect for human rights is no longer the sole responsibility of the State. Increasingly, multinational corporations are seeing the value in ensuring transparency and public accountability in their extractive industry operations. For example, BP’s human rights policy underscores its respect for internationally recognized human rights, and recognizes its responsibility to respect human rights and avoid complicity in human rights abuses. With this in mind, we request that the Consortium address the systematic clampdown on civil society in Azerbaijan with the highest levels of government, and demand the release of all political prisoners before signing the contract. The Extractive Industries Transparency Initiative (EITI) is the global standard for promoting open and accountable governance of the extractive industries sector, and until Azerbaijan left the Initiative in March of 2017, was one of the few remaining platforms in the country that provided citizens with a mechanism through which to hold the government accountable for its multilateral commitments. The majority of the consortium members, BP, Chevron, Inpex, Statoil, and ExxonMobil, holding 74.7% of the shares, are supporting companies of EITI, and should promote EITI within the framework of negotiations for the new contract. Despite two years of dialogue, EITI was forced to suspend Azerbaijan in March 2017 due to lack of progress on the Civil Society Standard. Following this decision, President Aliyev removed Azerbaijan from EITI altogether. While Azerbaijan has criticized this civil society benchmark as a shift from the Initiative’s original mission, the ability for NGOs to monitor implementation of transparency measures is an essential accountability tool that legitimizes the members’ implementation of disclosure requirements. Azerbaijan’s departure from the EITI underscores the government’s blatant disregard for public accountability and open governance. Azerbaijan’s newly formed national Commission on Transparency in the Extractive Industries is not an independent body with accountability mechanisms, but, rather, is under the State Oil Fund and headed by its Executive Director, Shahmar Movsumov. We urge the Consortium members, as supporting companies of EITI, to refrain from extending the contract until Azerbaijan rejoins EITI and makes a tangible and concrete effort to implement reforms needed for full membership. Extending the ACG contract now, in such an extreme atmosphere of repression and corruption in Azerbaijan would position the Consortium members as legitimizing the corruption, gross human rights violations and blatant disregard for the rule of law by the Aliyev regime. We, international civil society, request that the contract extension be delayed until: 1) Azerbaijani citizens have had access to information and an opportunity to comment on the extension of ACG contract; 2) the Aliyev regime releases all political prisoners, and; 3) Azerbaijan rejoins EITI and makes meaningful steps towards full compliance.